Hola Sylvie, thank you for your comment. A really feminine card, i love the pink colour. I think i need to try your paper wax technique, thank you for share your link:D.
Hugs from the melted island 28oC but you're with a heat wave, the summer in Sapin is very hard for me:C, i go to London in few days yupiiii! Fantastic card. I moved the link by copy and paste and it worked beautifully. Hi Sylvie , what a beautiful card...love the pink white and black together....Here in Italy it is soo hot too...tomorrow I will follow a copics workshop here in Rome, looking forward to it! This is so beautiful, I'm going to go check out that video right now! Beautiful card and thanks for the link to the technique, I just watched it and really want to try too! Oh wow Sylvie .. . .this has worked perfectly. You must be so pleased. It certainly turned out much better than mine did. Sylvie that really turned at well - beautifully done and thanks for the tutorial. 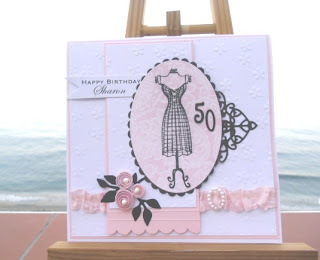 Oh this is such a gorgeous card - I love it! I tried to watch the video link but it plays the sound with no pictures - I think my interest is slow at the moment so I will defo try to watch it again later. I love the effect you get with it!